There is a song that I love that talks about how the things we suffer make us stronger. A few of the lyrics say something along the lines of “I would love to fix it all for you, but please don’t fix a thing whatever you do. Cuz these bruises make for better conversations.” I’ve been thinking of that song a lot lately. But I think that it’s the scars, more so than the bruises, that show the lives we’ve lived. Bruises come and quickly heal, but scars stay with you for the rest of your life. Of course this means physical scars, like the one I’ve got on my knee from whitewater rafting, or the one on my ankle from the killer mosquitoes in Machu Picchu, or the one on my foot from too much dancing in cheap shoes. But the deeper scars, and the ones that show all the more life, are the ones under the surface, the ones that can’t be seen. The scars that have been left from my travels, from the places I’ve lived and the things I’ve seen and the people I’ve met. They don’t cause scars at first; at first they are wonderful, magical, and life-changing. But it’s that very life-changing aspect that causes scars later on. It’s the separation, the tearing away from those things that I’ve grown so close to, that rips my heart and emotions apart and leaves deep, deep scars. It’s hard to cope with those scars. They are painful. They are there because something that touched me deeply is now no longer with me. But, as hard and as painful as it is to live with those scars, I would never choose to live life without them. Which scar would I give up? My precious host family in Costa Rica, who taught me not only about life there but about how to love others, love God, and be content with what I have? 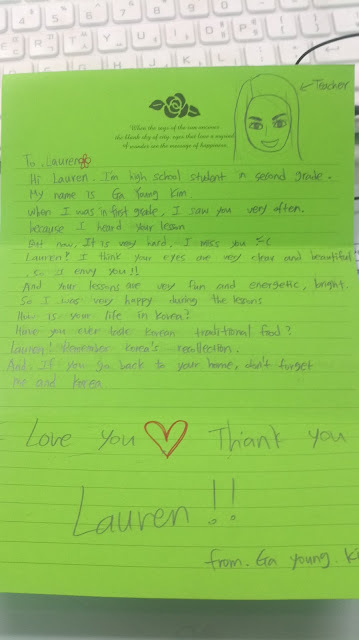 My dear students in Korea, who selflessly took time out of their insanely busy schedules to love on me, a sad and desperately homesick American very far from home? My beloved host parents in Spain, who cooked for me the best food of my life and with whom I know I’ll always have a home if I ever go back to Seville? Or perhaps I would choose to give up this most recent scar from Peru, in which the flexibility with which I came allowed me to meet some truly incredible people and see God work in ways that I have very rarely ever seen? No, of course not. There is not a chance in the world that I would ever give up what I gained from those experiences in exchange for a pain-free, scarless existence. As the song says, they make for better conversations and richer lives. The fact remains, however, that it hurts to be always and forever separated from things and places and people that you love. But I don’t think God has given me these scars – or anyone, for that matter – to cause us pain. If that’s what we think, we’ve just got to be missing something. In fact, I wonder sometimes if reflecting on wonderful things from the past makes it harder for you to focus on the wonderful things of the present. I know that’s something that I often struggle with. The real question is not how to avoid the scars, but rather how to live life in a way that amplifies the beauty of the here and now, rather than focusing on the pining for a beauty long past. The real question is figuring out how to use these scars of life, both the good and the bad, in a way that honors God and uses our talents and knowledge to their full potential. Perhaps that’s where the true beauty of life lies – in learning to live in a way that does not eliminate losing things you love, but diminishes those scars because you have learned to find beauty and joy in your present state, no matter what it is. There have been a lot of goodbyes in my life lately. At church, at Bible study, at school, at teachers dinners and meetings, even in neighboring cities….it’s been a very sad week for me. But I keep reminding myself that this is really a good thing. I’ve been in Korea for over a year now. I’ve invested a large percentage of my life into this place. I’ve laughed, I’ve cried, I’ve poured out my heart and life and soul into this country. The goodbyes are bittersweet, to be sure. But how much more tragic would it be if I had lived here for an entire year, and WASN’T sad to be leaving? How much sadder would it be if I had spent so much time here, but hadn’t plugged into the people here at all? If I had just considered this year a “pause” in my real life, and just spent all of my time here looking to the future, waiting until I could get back to where I was comfortable? The goodbyes are sad, of course. I can’t say that I’m HAPPY that I’m leaving these people and places that I’ve come to love so dearly. But I AM happy to be so, so blessed. I am happy to have made wonderful friends here, to have such precious experiences and memories from the past year. 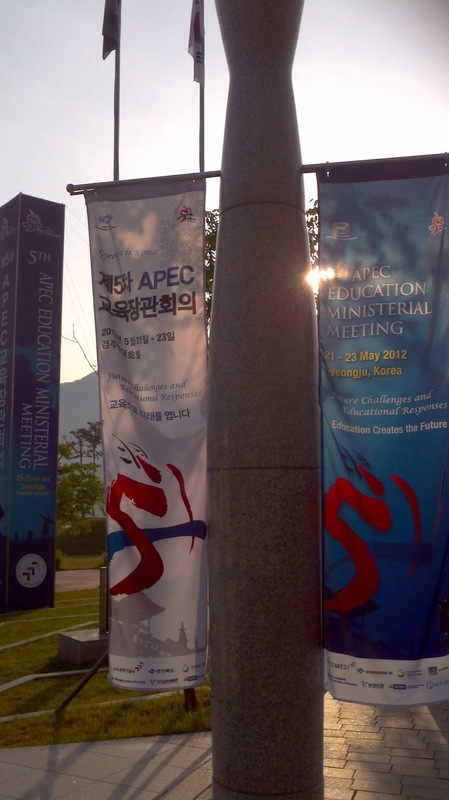 I am happy that a part of my heart has been embedded into the people and culture of Korea….for the rest of my life. And, at the same time, I am happy to be returning to America. Because I know that I have just as many blessings waiting for me back in the states, as I have in Korea that I am leaving. So this blog is just a collection of photos, and also a short video, of some of my favorite goodbyes this week. Captions explaining the pictures will be below the photos. Enjoy! Me taking on the world. 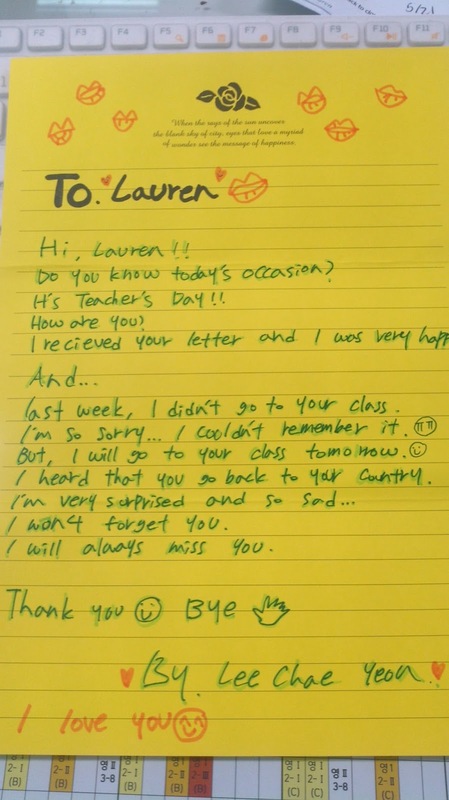 My farewell speech to the teachers of the school – completely in Korean. I so love this picture :). It’s also great being able to compare my first speech last year, with my last speech, and note how vastly much my Korean has improved :). I took a bunch of my second year students out for dinner. After the usual chaotic confusion of deciding where to go with a big crowd, we had a really good time. And then the waitress gave us soft drinks on the house, because she said that “it’s so beautiful to see foreign teachers spending time with their students outside of the classroom.” (Highly paraphrased, since it was all in Korean, lol) I’m really going to miss the generosity of Koreans…. I hope you take away good memories to your hometown, and make a smile every time you think about Korea. Also, congratulations with back to America, have a nice time with your family :). Oh! Don’t forget to upload to Facebook. Haha. One of my hope is going to the USA. I’ll let you know when I go to the USA!! I wish I could see you again :). The time with you was special, and it will remain good memories in my heart. Thank you and love you, Lauren!! Good luck in everything!!! Love, from Chae-yeon. The last time I went to a baseball game was 2 years ago, in Atlanta. I remember being impressed back then with the “culture of the Braves,” as I put it. The crowds, the advertisements, the entertainment….it was all quite an experience (you can read about that day here). Definitely not something that you see on an average day in America. But America has nothing on Korea. 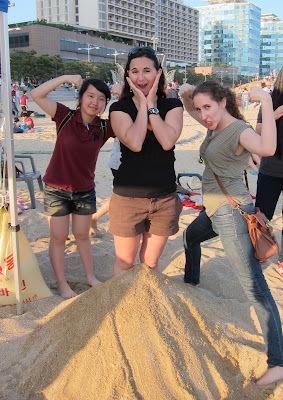 A baseball game in Korea….is truly unlike anything I’ve ever experienced. I’m not really sure where to start. I suppose I could start with the scalpers that swarm you when you try to buy your ticket. Literally – they swarm you. Like, so thick that you can’t even get to the vendors. But then, I suppose there are scalpers in America, too, so that’s not such a huge deal. Ok, well then maybe I could tell you about the cheerleaders. About their cute little Korean dances that they perform in between every inning, or the mascot break-dancing competition that they had instead of the 7th-inning stretch. But then, I suppose American mascots do silly things too, so many that’s not so impressive, either. Of course, the way that they bring in their relief pitchers is pretty special – escorted onto the field in a souped-up mini cooper. But even with that, the argument may be made that it can be found in other places. The really unique part of a Korean baseball game would have to be the fans. Like, when they did the wave – in super slow motion. And it still made it around the stadium 3 times. Or, how every player on the home team has a theme song that is played when they come up to bat – and the fans know every.single.song. And they cheer, and clap, and sing along with every.single.song. Or how they sing for their home team (the Lotte Giants), to the tune of the most random American songs. Think along the lines of “Glory, Glory Hallelujah” – Lotte, Lotte, Lotte Looooooootte! It’s hilarious. Oh, and those songs are also usually sung with the entire stadium standing with arms linked and swaying back and forth in unison to the music. And they bring handmade pom-poms and wave them with enthusiastic vigor….pretty much always. The entire 3 hour game. But my favorite part, by far, of a Korean baseball game, was the bags. Yes, the bags. Around the end of the 7th inning, park employees start walking around handing out orange plastic bags. And people put them on their heads. They do bowties, or headbands, or sometimes belts; but the most common adornment was simply a big ball of air that is then tied to one’s ears. Bizarre, right? Wrong. Here in Korea, it’s….totally….normal. And that, my friends, is why I love Korea…and why a Korean baseball game is an event that simply cannot be missed. Following the game, I had another cultural experience. I went to a…..drumroll, please…..jjimjilbang!! A jjimjilbang is essentially a sauna and a cheap place to sleep. There are usually 3 floors – 2 for the saunas (gender-segregated), and 1 common area for sleeping and relaxing. But oh no. A jjimjilbang is so, so much more than that. When I got there, I was given a locker key and a pair of unisex pajamas – nothing more. I made my way to the women’s sauna, and found the lockers. Into these lockers go all of your stuff. And I mean everything. Including all of your clothes. Every.last.stitch. After you get good and naked, you head into the sauna part. First, there are scrubbing stations. And I mean that in a very literal sense of the word. There were walls about 4 feet high, with faucets coming out of them, buckets in front of them, and mirrors on the walls in front of the buckets. So you found a bucket, sat down, and scrubbed. You scrubbed until you were squeaky clean, until you couldn’t scrub anymore. After you had made sure that you wouldn’t contaminate the public pools, you could choose a pool to soak in as long as you wanted. There were several pools, each of varying temperature – the hottest was like 56 degrees C, although I was only able to handle up to 40 degrees. There were also showers of varying pressure and temperature that you could soak under. There was a pair of girls who unknowingly became my heroes that night at the jjimjilbang. I had never been, so I had no idea what to do, and you can bet your boots that I’m not going to walk up to someone and fumble around in Korean asking them what I should do when we’re both stark naked. So I just watched the girls out of the corner of my eye and did whatever they were doing. I’m not a creeper at all…haha :). Anyway, once you were tired of getting shriveled up like a raisin, you put on your stylish PJs (boys got blue, girls got pink; that was the only difference in them), and made your way to the common area. There were no beds – just a big open floor, and piles of incredibly thin mats and strange brick-shaped pillows. When you got tired, you got a mat and a brick and set up camp in whatever area of the floor suited your fancy. Until you got tired, however, there were plenty of other things to keep you occupied. They had big TVs blaring – which was nice, until it got to be around 1:00 am, and then it got a little annoying. There was also a restaurant with a simple menu, and massage chairs – although they were about as relaxing as a massage with a jackhammer – and actual masseuses, as well. My favorite part, however, were the sauna rooms. There were 5 separate sauna rooms in the common area, in addition to the pools on the men’s and women’s floors. These rooms, however, had no water in them. They were heated rooms made entirely of different materials – the different materials were supposed to give out different medicinal effects. There was a natural salt room, a wooden room, a rock room, a crystal room, and a coal room (that was the hottest), and also an ice room, as well. It was pretty cool…no pun intended…haha :). So the sauna part of the jjimjilbang was nice, but not much of the actual sleeping part really happened, so by the next morning I was pretty tired. But, there is no rest for the weary! I had promised Jeanine, my pastor’s wife, that I would help her that day. She’s teaching an intensive summer course at the university, and also taking care of a newborn, and was feeling a bit overstretched, so I told her I’d come help with some of her grading. So early Wednesday morning, I took a train from the jjimjilbang to Gyeongju; then from there, took a bus to Pohang, and arrived at her university around lunchtime. I helped her with her grading, then had dinner at their house, and pastor Mario then drove me back to Gyeongju, where I was just in time to catch the Wednesday night Bible study at church. Needless to say, by the time I finally fell into my bed that night, I was more than ready for a good night’s sleep. Overall, it was definitely worth it, though :). I had a blast, and I feel so much more Korean after having experienced both a baseball game and a jjimjilbang – on the same day, no less!! At the beginning of the game….they didn’t seem too crazy…. OK, now it’s getting a little crazy….teenage guys bringing homemade pom-poms…. The entire stadium with linked arms, lustily singing at every opportunity…. ok, now it’s getting really weird…. What a weekend I’ve had! I decided that it had been a while since I had done anything truly crazy – running away to live in Korea for a year notwithstanding. So, last weekend my friend Sarah and I decided to go…….paragliding!! It was something I’ve wanted to do for years now, so when my friend Lorna messaged me saying that she was getting a group together to go, I jumped at the opportunity. And Sarah, even though she lives really far away, decided to join me. 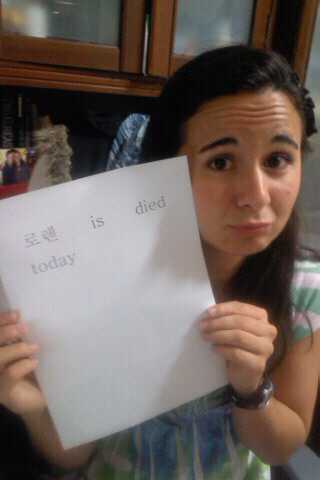 So Sarah got to Gyeongju around 8:00 pm on Friday night. We had cake, exchanged gifts (we always give each other presents when we see each other), and stayed up late talking. Then Saturday morning, bright and early, we caught a bus to Ulsan. After meeting up with a few other people who were also going with us, we met up with our tour guide and headed up the mountain. I tell you what, people do things differently in Korea. When I went skydiving in America, everything was very well defined. We went to a certain place, we had a certain launch time, there were numerous forms to fill out for legal purposes, blah blah blah. When I went paragliding in Korea, we met this guy and his friend at a hotel, had some rushed conversation in Korean with them for a little bit, then got into their personal cars (I was certainly glad for safety in numbers!) and drove to the launch site. Along the way we just randomly pulled over on the side of the road and hung out for a while, then got in the car and continued our journey. No one knew what was going on, lol. The actual jump was equally confusing. The guides spoke almost no English, and we spoke almost no Korean, so there was a lot of pointing and grunting. That’s one thing about Koreans that bugs me. If you don’t speak their language fluently, they often don’t say anything when they want you to do something – they just use gestures and inarticulate sounds. But in my experience at least, I’ve found that people make a lot more sense when they talk, even if you don’t really speak their language. Even if you can only catch a word or two, you can usually piece that together with their body language and figure out what it is that they want. But a total lack of words usually just makes for one very confused foreigner. But anyway, we finally made it up to the jump site and got suited up and ready to go. This was about the time that I started freaking out. I’m not particularly fond of heights – just the opposite, in fact. This fear of heights is exactly why I insist on doing so many things involving heights – I don’t like the idea of being beaten by a fear – but it also means that I always freak out just before the plunge. The jump was terrifying – who originally thought that strapping a kite to your back and jumping off of a mountain was a good idea?? – but after that it was fun. Not nearly as much of an adrenaline rush as sky-diving, when you’re free-falling from 15,000 feet. But it was relaxing and soothing, and I got to observe the entire countryside from above. Overall, a pretty awesome experience. I’m glad I did it. One of the paragliding instructors offered to give Sarah and I a ride to Gyeongju, since we lived on the way to his house. So we accepted (once again, the whole safety in numbers principle), and I had a conversation with him in Korean all the way from Ulsan to Gyeongju – about an hour. It was very empowering :D. After we returned home, Sarah and I went for a walk, and took a nap among the hill tombs in town. Our friend Art, another Fulbright teacher, was meeting us for dinner, and we didn’t want to go home before that, so we just curled up in the sun and went to sleep while we waited. Oh, and got ice cream. Yummy :). Once Art arrived, we went to an Italian restaurant. We realized as we ate, that we were the 3 youngest Fulbrighters, all together in one place. We’re the only Fulbrighters who were born in 1990. Just a little tidbit, but I thought it cool :). After he left, we went back home and had a girls’ night – chick flick and painted toenails, for the win! Sunday morning Sarah went to church with me, and then we went to the cake decorating place. Sarah had heard about it from when my students took me before, and really wanted to go, so I took her while she was here. We had a blast. The store owner seemed rather terrified when 2 foreigners walked in, because he didn’t speak any English, but we were fine. He was really nice :). We took our cake home, and ate it in the evening with my host sister, In-suk. It turned into a mini party of sorts. In-suk was in a really playful mood – it was fun to see a lighter side of her. She’s always at school or just super tired when I’m home. But this night she was laughing, joking and cutting up. The cake had 2 face cookies on them, and she ate one of them – which she decided was me. For the rest of the evening, she was making jokes about how Lauren had died, and she was so full because she had eaten Lauren, yada yada yada. She even printed out a piece of paper that said “Lauren died today.” It may seem silly or even slightly morbid to you, but to me it was the humorous side of In-suk that I rarely get to see, and it was delightful to be around. So Sarah left me early Monday morning, and now it’s back to my normal life. I miss her, but we had a lovely time together. I met with a Philippine friend from church on Monday afternoon for a lesson in Tagalog (the language of the Philippines). I’m not really sure why we decided to do that, since everyone in the Philippines also speaks English and I’ll never really have to learn Tagalog, but I had a blast, anyway. I loveeeee languages :). We decided after the lesson, kind of spur of the moment, to go see Men in Black 3. It was a lot of fun, although we saw a TON of my students, all of whom are now convinced that I have a boyfriend, so I’ll have to deal with that next week when I go back to school. I won’t see them this week because they’re going on a school trip, so I get a week off – woohoo! Time to catch up on everything that was neglected while we were preparing for the performance :). So that was my weekend! Undoubtedly one of the best this year!! This weekend I headed up to Hwacheon, for what was undoubtedly my last trip up there – possibly ever, and certainly during the remainder of my Fulbright grant in Korea. Knowing that made the whole weekend a little bittersweet, but it was still a great time overall. School’s been really stressful and exhausting lately, so honestly I really didn’t want to go – I would have much preferred to just stay in Gyeongju and rest – but in the end I’m glad that I did. I think I really just needed to get away from Gyeongju for a little bit, and I got plenty of rest during the 6-hour 1-way trip there and back :). So anyway, the purpose of my trip was the 7th annual Hwacheon peace forum. It was a really unique experience. Around 20 American English teachers are each paired with a Korean high school student, and we spend the weekend getting to know each other and promoting inter-cultural peace and understanding. I got to the meeting point around noon on Saturday, and had lunch and caught up with the other Fulbrighters who were participating. It was really nice to see them. I hadn’t realized how much I missed talking in fluent English to people, and not being interrupted and ignored whenever someone came along saying something in Korean. So it was a nice time to re-charge my batteries, which had been sorely worn down from frustration at school. Anyway, since we were short on time, we jumped right into the weekend’s activities. We drove to the Hwacheon cultural heritage museum first, and that was where we met our Korean “partners.” They took us through the museum, telling us about some of the stuff behind the cases. We even got an opportunity to dress up in tranditional Korean clothes, and I convinced my partner, Gwang-sik, to dress up with me and take a picture. It was fun :). After that, we headed to the DMZ. I had been to the DMZ before, during orientation, but it was much different this time. We went to a different zone, one of the closest South Korean bases to North Korea. I could literally see the North Korean guard houses across the 3 layers of barbed wire fence and land mines. We were cautioned that, while we were outside and within visibility range of the North Koreans, to please “don’t do anything that would make them suspicious and cause them to shoot on you.” Comforting words, no? Aside from that, though, it was much more poignant experiencing the DMZ with Koreans. I talked with several of them who had family in North Korea; hearing their stories, seeing their earnest desire to be reunited with their families, touched me in a way that a simple tour of the DMZ could have never done. After the DMZ we headed to our lodging for the night – a hanok, or a traditional Korean-style house. We got a couple of demonstrations before dinner – how to make ddok (Korean rice cake) the traditional way (basically, by just pounding the living daylights out of super sticky rice and constantly rubbing water over it), and also how the hanoks were constructed. We got to try to put together a model of one of the corners of the house – it was fun, like an enormous puzzle. We also got to try our hand at pounding the rice, and I’m happy to report that the carpenter’s daughter did not disappoint, and that I pounded it quite satisfactorily (thanks, dad!). That evening, the Korean students’ parents treated us to a Korean barbecue dinner, with watermelon for dessert. Yummyyyyy. We played lots of games outside until it got dark, and then we all moved inside and played more games. I love group games, but I don’t often get to play them, so this was a lot of fun – the added cultural element of doing it with Koreans and Americans made it all the more interesting :). The next morning we went to see the World Peace Dam and Bell. I found the bell, which weighs around 35 tons and was made from the recycled shells and casings of wars that have been fought all over the world, very symbolic and moving. That was also where we had our official “peace talk.” We sat down in a group, and just popcorn-commented, each person sharing their feelings on peace, North/South Korean relations, the roles of foreigners in the Korean conflict, and whatever else they wanted to say. It was a very moving, touching time. I felt so honored to be a part of such a special time of cultural exchange and awareness. There are 4 doves, facing North, South, East, and West. If you can see in the picture, the dove facing the North has a broken wing. It will be repaired when North and South Korea are re-united. After the peace talk, we got to take a ferry back to Hwacheon – I was super happy about that. I loveeee boats :). And then, that was it! Many Fulbrighters had traveled a really long way, including myself, so no one really wanted to hang out much after the weekend ended. We all scattered and headed our respective ways, wanting to get home so that we could finish up our lesson plans for this week and get some sleep. I finally made it home around 9:00 pm. It was a long weekend, but I’m really glad that I went. Now if I can only make it through this week, I’ll be golden! I feel like the little engine that could this week – I keep saying, “I think I can, I think I can, I think I can.” I’ve learned to not even think about the entire day – just focus on what’s right in front of me. Getting through a 50-minute class is much more manageable than worrying about 7 classes, 3 lesson plans, dance practice, and 12-14 hours at school every day. So, I focus on the immediate future, and take naps as often as possible, and I’m somehow surviving this week. It doesn’t help that I’ve been fighting a nasty cold – it’s finally started getting better this afternoon, but the last 5 days have been truly unpleasant.